Welcome to Three Times A Charm. I love to introduce readers to the people involved in children’s publishing. Today we welcome publisher, Ellie Sipila from Common Deer Press. Thanks for joining us, Ellie. Tell us a little about you, please. Hi there. 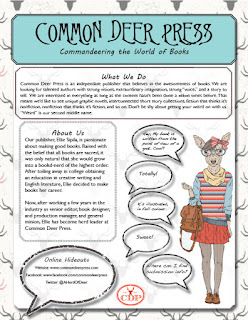 I’m Ellie Sipila, and I’m the acquisitions editor/publisher of Common Deer Press. On top of being a published writer myself, I hold a Publishing certificate from Ryerson University. Being the professional kind of nerd, after a short (and somewhat unfulfilling) stint in Engish Lit, I figured out that actually, my passions were with making books, not so much dissecting them. So I enrolled at Ryerson for all three kinds of editing, went on to get a specialization in editing books intended for young readers, then rounded out my education with courses in book design and physical and digital book production. Now, at Common Deer, I am living the dream by acquiring great manuscripts and making them as awesome as is humanly possible. Oh that sounds both exciting and impressive. 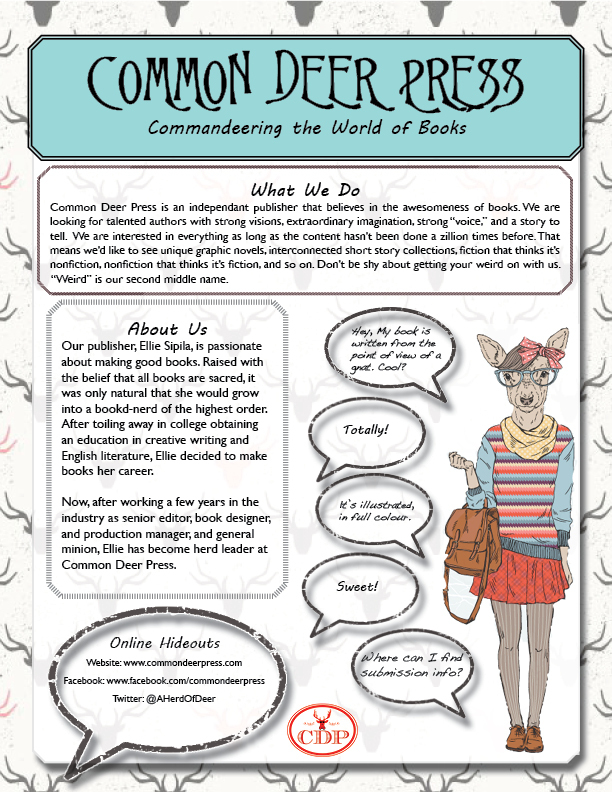 Can you tell us more about your publishing house, Common Deer Press? Common Deer Press is looking for the unusual. We are tired of being “common” deer. We want to be different. You know those deer you see form time to time in the woods munching bark, scratching their fleas, wearing glasses? NEITHER DO WE!!! We want to be those deer (minus the fleas part). Have a set of interconnected short stories? We want that. Have a YA novel written completely in verse? Send it our way. Basically, as long as there is not too much kissing (ie., no erotica please), we’re interested. Children’s books, adult books, fiction or non (or fiction that pretends it’s nonfiction). Throw it at us. *Snort* Now for the threes. Give us your top three answers to these questions to help us get to know you a little better. 1) Squirrel Seeks Chipmunk written by David Sedaris and illustrated by Ian Falconer. This book embodies what we love in a book and what we’d love to publish at CDP. It’s funny, a little bit disturbing, and it’s highly unique. Also, it’s a beautiful book full of colour illustrations and awesomeness. Yes please! 2) Warren the 13th and the All-Seeing Eye by Tania Del Rio and illustrated by Will Staehle. It’s spooky, it’s silly, and it’s GORGEOUS visually. 3) The Phantom of the Opera by Gaston Leroux. Beautiful writing, music, and spooks! Doesn’t get much better than that. 3) Wait…what does the word “leisure” mean again? 3) People who believe EVERYTHING I say and obey me 100% of the time. Ha! I think that last one is inherent of publishers. *wink* Ellie, where can our tech savvy readers find Common Deer Press? Thanks for joining us today, Ellie. It was wonderful to get to know the quirkiness behind the curtain and to learn more about your publishing house. Many happy submissions! LOL! That was a fun interview. Oh my. Love it...minus the flees. So fun! Right? I want to write something quirky so I can work with Ellie! Nice interview! Looks like a fascinating publishing house. I love the refreshing approach to acquisitions. Funny, quirky people are the best! And it's important to model it for young people so they know it's okay to be that way if that's what's comfortable. Let loose! Quirky is good. Sounds like a great publishing house. Enjoyed the interview.